There’s a new pattern in the Crochet Spot Store! This pattern is for a decorative garland of maple leaves! Crochet a long string of leaves to frame around a window, hang along a fire place mantel, or decorate a wall. Each leaf is crocheted separately then assembled together to form the garland. There is no sew required in the pattern! The pattern includes a step-by-step tutorial to show you how to assemble all the leaves together into the garland. 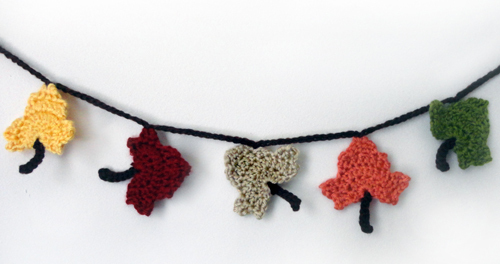 Feel free to crochet as many leaves in as many colors to make the garland as long as you desire. Due to the shaping of the leaf, this pattern is not recommended for beginners unless you’re up for a fun challenge. This entry was posted on Sunday, October 7th, 2012 at 12:00 PM by Rachel Choi	and is filed under Best Crochet Patterns. You can follow any responses to this entry through the RSS 2.0 feed. You can skip to the end and leave a response. Pinging is currently not allowed.